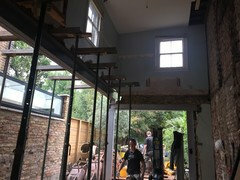 Confused by our Victorian internal walls – thoughts?! Hi all, we're currently getting structural drawings drawn up to remove the internal (load-bearing) wall between our living and dining room. We live in a standard two bed Victorian terrace in London. 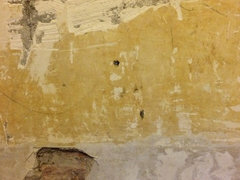 We were advised to remove the plaster on a section of the wall so we could see how the wall is constructed. I expected brick, but I'm only seeing a horizontal timber. I've tried to remove more plaster but it's not normal 'plaster' and is very stubborn. Does anyone know how this internal wall is likely to be constructed? I'm intrigued. Hi there! Usually it's brick. 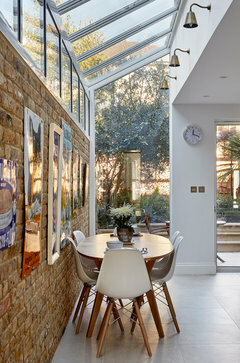 We recently finished refurbishment of victorian house and during demolition found great looking brick. What height is that timber? My first thought is that it is a lintel- perhaps at one time there was a door or hatch there?? I think you need to knock off more plaster to investigate further. try www.purlfrost.com - I used their opaque film for two jobs this weekend:- (1) an internal glass door which was a kitchen but now a bootroom; and (2) the utility room window which was directly overlooked by the neighbours. -You keep all the features and light but get the privacy and and it looks quite smart for a fraction of the price of new glass. How best to hide these electrics above our Victorian front door? Hi - in response to Carol's comment, I attach a photo of what we've done so far. We had the power company come in and move the meter down slightly (that was the bit on the left in the original photo above) and put it onto a smaller backplate for us. Then we had our electrician in to put in a new fusebox. Then we had our carpenter in to make a small box picking up the moulding on the inside front door, which also matches the doors leading off the hallway. We had the plasterer in to make good the area. So far that's where we are as we don't want to paint until we do the whole hallway, and first we need to change the radiator from the old flat panel one to something more in keeping with the property. I particularly resonated with Jonathan's comment above, with the thought that the eye wants to 'read' the ceiling and floor details...we felt a big box going across the whole top of the front door would feel a little 'top heavy' - as we came down the stairs and as you entered the hallway from the kitchen. We are pleased that the footprint of the whole thing was massively reduced. It turns out to be a handy little place to stash a torch as well. Thanks for everyone's comments - it was very much appreciated. Maybe I can send a photo of the final final result once decorated! Thanks guys - we did a lot of experimenting and testing on some old floorboards before deciding on this stuff. The Osmo oil gives a deep and rich finish on old pitch pine that looks very different to varnish - deeper and with more of the grain being brought out. It's more like a beeswax finish from olden times, without the backbreaking labour and maintenance. Interestingly on the new boards (in the top bedroom), it makes far less difference: the new pine just looks yellow and shiny, much as it would if varnished. But the oil should be tougher and lower maintenance. We decided to restore these floors rather than replace as they were actually in remarkably good condition: this house has never had fitted carpets fitted, nor central heating fitted until 2014, and when it was installed it was installed with regard to keeping the floors intact (many systems installed in past decades saw the boards sawn up and hacked about). I wanted look that is obviously original, and can't be mistaken for engineered wood. I did think about a limewashed finish, but bottled it at the last minute and went totally traditional, as I thought less risk of a finish done to a trend that would be hard to reverse. Dark Victorian hallway - colours? Do you have any photos of the space? It would make it easier to visualise. It's 1.4m up from the floor! Will try and knock some more off lower down to see if that reveals anymore info. It's more like concrete than plaster, horrible stuff! 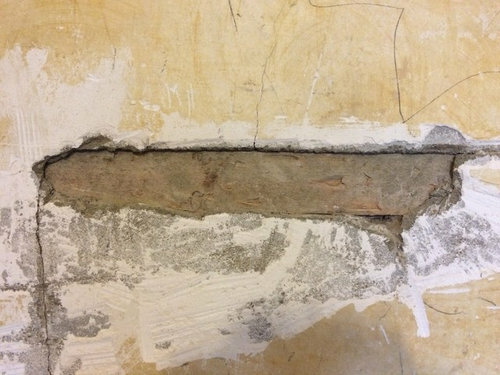 As older houses were built before plasterboard was invented there is often a layer of coarse concrete-like render under the plaster top coats which was applied directly to the bricks. I believe horse hair was sometimes used to help bind the mix.